Almost all types of industrial heaters require some form of maintenance. The exception is an AmbiRad heater, which emits heat through electric infrared rays. This is not real heat but a form of resistance heat. The heater, thus, doesn’t contain any motors or moving parts that can wear out. Because of that, you will require no lubricants or air filters. The biggest maintenance for this type of factory heaters you will do is clean the reflectors and replace the source of heat. All kinds of factory heaters come with additional operating costs. But did you know that an AmbiRad heater can save up to 50 percent of your operating costs? After all, the heat is not sent through convection, which means that there is no room for it getting lost due to rising hot air. Visualise yourself using this type of factory heating serving you for a long time. The quality of heat you will get shall depend on the ceiling height, insulation, and construction type. One of the reasons why an AmbiRad heater will last long is the clean energy it produces. By its very nature, it heats up the factory using electric infrared rays. It doesn’t emit any of the by-products of fossil fuels. That makes it a clean source of energy. Did you know that the accumulation of soot and other oil by-products can make factory heaters get spoilt? 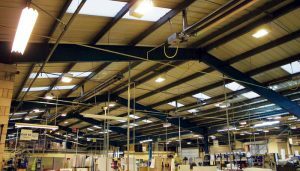 On that account alone, this type of warehouse heating systems can last for as long as it takes. You will also be happy breathing in the clean uncontaminated air while working in the warehouse. Clearly, in addition to its many advantages, an AmbiRad heater can last for a long time. If you are looking for factory heating systems that will serve you for years to come, this is the product you should have. After all, they require negligible maintenance. You will end up spending very little to take care of an AmbiRad heater.